I've planned to start this blog since January 1st. 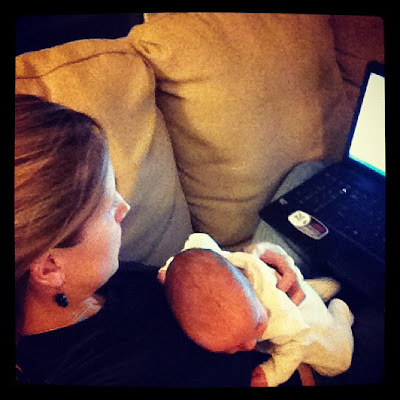 But somehow, every time I sit down to blog, a baby starts to cry. It's the exact same thing that happens as soon as I fix a plate of food or lay my head down on my pillow. So, that's the reason it's January 9th 10th and I'm just posting my goals for the year. I'm a goal gal. I love to have me a to-do list to check off. And I love to have a plan. If not, I feel like I squander my days away without getting anything done. Even more so since I've been at home everyday. My to-do list used to be long everyday. These days my to-do lists are shorter. And muuuch more basic. Like unload the dishwasher, bathe the boys, and do one load of laundry. If I get all of this accomplished in a full day at home, I feel productive. Which sounds insane! But honestly, I started out when the boys came home trying to accomplish waaay too much and ending up paralyzed by all I wanted to get done. Not sure where to begin on my list. Frustrated because less than 50% of my to-do list was checked off. And, not to mention, exhausted. So I've got some pretty specific goals for this year. And then some more general goals for the year. Set monthly goals - Feeling productive keeps me motivated to continue my goals. Typically I set my yearly goals and never actually accomplish them that year. They are too vague and 365 days is just too long. I need short term goals to keep me focused and motivated. Make 2 gifts per month - I'm hoping to make the majority of our Christmas presents this year. This past Christmas I started my shopping in August. I knew that I would not have time to shop and wrap gifts once the boys arrived so I bought and wrapped everything by October. It was fabulous! And not like me. Normally I wait until about November to start my shopping. This year I truly enjoyed buying gifts. I got to be intentional about my gift-giving. Not impulsing buying things because I was running out of time. And I got to look for sales, which definitely helped the Christmas budget :) So, this year I decided I also wanted to get my gifts wrapped early - but instead of buying them, I'm hoping to make them! I'm going to shoot to make at least two per month until we get closer to Christmas and I might have to make some more each month. I've already bought my supplies for a project and I've already completed (with my dad and sister's help) one birthday present for this year! Sew and monogram a longall or shortall for Crews and Tate - I got a monogram machine!!! I'm so so so excited! And again, I'll blog more about what I'm doing with it soon [this whole "I'll blog more about it later" is starting to be a theme - I better follow through!] but I am really wanted to teach myself to use it well. So, I want to make and monogram an outfit for each of the boys [well, just Crews and Tate - not sure Jordan would appreciate a jon jon :)]. A very specific goal that I hope to check off the goals sooner rather than later! Blog twice a week - Okay, so I've totally already failed at this! But, I didn't want to take it off my list because I've already failed - I'm going to keep trying. I really want to document this time in my life. And it's going to take a little discipline but I think I'll regret it if I don't do it! Be intentional and love well - Last year I had two overall goals. I would say that I achieved these in some ways but not.so.much in other areas. The Lord really worked on my heart last year - especially in the live simply way. I learned a ton. But, I've got so much further to go. As I learned more about living simply and the allowed the Lord to mold my heart, I realized I needed a lot more molding and many more lessons. And the same with loving well. I want my life to be intentional. I want it to be about my boys [all three of them] and my family and my friends and the woman behind me in the drive-thru. So I am going to love well. Through hand-written notes and conversations and texts and prayers. I plan to check in on my yearly goals when I review each months goals and post new goals for the following month. And, I'll be posting my January goals tomorrow. Yes, even though we're already halfway through January. I've been working on them already - even though I haven't posted them! What about you? Did you write a goal post? Give me your link in the comments and I'll come check it out! Haven't posted my goals///hope to soon! Good for you....let alone you as a mom of TWINS. Love your sweet blog!